If you could double the words read per minute, you would half the time it takes to read any given text. Speed reading refers to a number of techniques used to improve the reading speed significantly. When it comes to techniques, several can be used. Skimming for instance is a method in which one scans paragraphs or pages of text quickly to find the meaning without reading all of the words. Another popular theory is that subvocalization, that is the inner vocalization during silent reading, slows down the reading. Elimination of it would therefore improve the speed in which text is read. Spreed for Google Chrome is a speed reading extension for the browser that aims to help you read text faster that you encounter on the web. It does so in its own interface that you can resize to your liking. There are two options to load text into the interface. The first involves highlighting text on a website and using the Alt-V shortcut to load it automatically into the extension's interface, the second to highlight text, right-click the selection, and load it this way into it. 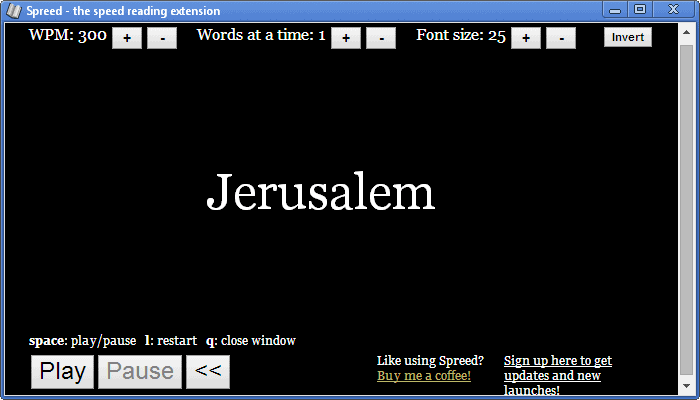 One word is displayed at a time and 400 words are displayed per minute when you hit the play button. If you are new to speed reading, this may be too fast for you. You can use the controls at the top to reduce the words per minute count. The count goes down or up in 50 words per minute chunks only, so keep that in mind. Note that the speed is automatically adjusted when you hit the plus or minute buttons in the interface. Here you can also increase or decrease the words at a time count -- default one -- and the font size of the text displayed in the extensions interface. Last but not least, it is possible to invert the color scheme so that black text is displayed on a white background. You can toggle play with a tap on the space bar or a click on the play or pause button. The hotkey l enables you to restart from the beginning, while q closes the window. The interface is quite noisy, with all the text displayed at the bottom of it. You can resize the window to hide the lower part of the interface. Since you can use shortcuts to control playback, that should not be a issue. Spreed is not teaching you how to read faster. While you can use it to adjust the reading speed to improve it over time, it does not teach you how to do so. If speed reading is a new concept for you, try this guide which teaches on method. I always thought when I moved up from 300 baud, to 2400 baud and then faster it helped me be a better reader. Maybe an app that does text flow using that method would be a better approach. MAELISH WROTE: I’m not wild about the concept because you can’t look away or pause to consider the implications of what you’ve read. MY RESPONSE: Agreed! I remember taking the Evelyn Wood speed-reading course in high school (so we’re talkin’ the mid-’70s); and that was my concern both then and now. Nothing I’ve read or experienced since has moved me away from that concern. Actually, I don’t mean to be the persnickety person in the conversation who corrects everyone, but *AS* an oldster who’s been in datacom since its early days, I hate to see the term “baud” misused. While there actually can be a “2400 baud” modem, usually people actually mean “bits per second” whenever they use the term “baud;” and they are not the same. A “baud” is technically one change in signal state per second. If the receiver can discriminate between exactly two states, then you can send one bit per baud. If the receiver can discriminate between more than two states, then you can send multiple bits per baud. For example, the old Bell 103 modem standard switched between two frequencies (FSK), changing frequencies 300 times per second. Thus, you could transmit 300 bits per second with this 300 baud modulation scheme. The Bell 212 standard used 4-way phase modulation (QPSK), and could thus transmit 2 bits per baud. This modulation scheme is 1200 bps at 600 baud. The V.22bis scheme used quadrature amplitude modulation (QAM) with four phase angles and four amplitudes, for a total of 16 possible signals, and thus carried 4 bits per baud. Operating at 600 baud, it was a 2400 bps signalling scheme. The V.32 spec was 16-QAM at 2400 baud, for 9600 bps. As it happened, most people ignored this subtle distinction, and just used the word “baud” as though it meant “bits per second”. It used to be quite common to hear people refer to their “2400 baud” or “9600 baud” modems, when they really meant bps. Only the most pedantic or technical discussions insisted on proper use of the term. I suspect that the SI (metric) penchant for naming every combination of units after yet another another scientist added to the confusion. If a Newton is shorthand for a meter-kilogram per second-squared, and a Joule is a Newton-meter and a Watt is a Joule per second, and a Volt(a) is a Watt per Ampere, you can see how people might have formed the mis-impression that Baud(ot) was a short name for a bit per second, especially given early signalling schemes that could only discrimate 1 bit per baud, and so where the “baud rate” was indeed the same as bits per second. It’s very rare for me to see the term “baud” outside of the context of analog modems. These days, people usually refer to the speed of a link in bps, and might occasionally refer to the modulation scheme when necessary. For example, people will usually say that a DOCSIS cable modem transmits at 30 Mbps downstream. If you look, you’ll find a reference to 64-QAM (6 bits/baud) at a baud rate of 5.056941M symbols/second. But nobody talks about a “five megabaud cable modem” or even incorrectly as a “30 megabaud” cable modem. We’ve learned our lesson, and the term is just “bps” now. It’s worthy of note that though Davis talks about a cable capable of “five megabaud,” the practical reality of datacom is that “2400 baud” is as high as “baud” goes; and it’s the modulation scheme that determines the number of bits-per-second contained in said 2400 baud; and since that can vary, it’s impractical to even use “baud” beyond 300 bps. In fact, because it’s uncommon to ever specify the modulation scheme, it’s better to just ignore “baud,” no matter the data rate, and only state things in bits-per-second (bps). Even though I go back to the days of 300 baud modems (and we used to sit around and joke about whether the correct word for the plural should be “modai”), and even though “300 baud” is what we called it back then, today I only use bits-per-second to describe any modem speed. In fact, the word “baud” fell out of my personal lexicon the instant two bit-per-baud modulation schemes (QPSK was but one of them at the time) came about. …as a daisywheel-style both typewriter and printer, at home. AJ, at the time, was trying to stay alive by OEMing what were then high-speed synchronous 9600 and 14.4kbps modems with and without internal multiplexors. Having worked with such equipment at Paradyne Corporation, AJ recruited me; and we did okay, but since AJ wasn’t manufacturing the products, it was easy to lose to larger players in large and hotly competitive deals. My region was number one of the three in the US, but the company was still in trouble by 1987; and CXR finally bought it in 1988. I got out just before that, just in time. The baud unit is named after Émile Baudot, the inventor of the Baudot code for telegraphy. Heh… no, I literally moved from a 300 baud modem to a 2400 baud modem. So I was being quite literal. I would like to reconmend BeeLine Reader, a free extension developed for Chrome. It makes reading more pleasant, more effective, and therefore also faster. MAELISH WROTE: Heh… no, I literally moved from a 300 baud modem to a 2400 baud modem. So I was being quite literal. MY RESPONSE: Heh… obviously. If you literally moved, then you were being literal. Duh. In your arrogant and intransigent refusal to be educated, though, you missed the point. By stating it in “baud,” you’re not telling us anything. At 300 baud, yes you were at 300 bps; but at 2400 baud, depending on the modulation scheme, you could have been at any speed from 2400 to 9600; or even, poetentially, 14.4Kbps. Which was it? By not stating things in bps, as pretty much everyone in the world now does, you introduce unnecessary ambiguity into the discussion. And I couldn’t be any more literal than that. There is a reply level limit here on the site. MY RESPONSE: A typo? You’ve had someone in your life so correct you over the years that you’ve become so averse to it and those who trigger your feelings by doing it that you torture the act of otherwise reasonable criticism by citing a mere typo? Are you freakin’ KIDDIN’ me? [shakes head in disbelief] And no disingenuous smiles, please. You, me and God all know what you’re doing. No amount of your viscerally negative response to others’ offering well-documented (and so, then, unassailable) correction is going to make anything I wrote — ANY PART OF IT — wrong. The bottom line is that clarity is diminished whenever “baud” is used instead of “bits per second” or “bps” at any speed greater than 300 baud and/or bps. That is unassailably correct. You would prefer ambiguity? Hmm? In the world of computers, where everything is binary, yes/no, right/wrong, black/white, ones/zeros… no gray area; in that world, where things are so precise that a single comma or space in the wrong place in 10 million lines of code can keep a program from compiling; you want to challenge the inherent (and inherently and facially correct) notion of that using “baud” instead of “bps” injects unnecessary confusion and imprecision and ambiguity into the conversation; and that that’s a bad thing? Really? Are you, again, KIDDIN’ me? And get some perspective: a typo is just a typo. Even professional book publishers make typesetting mistakes. I’m reading a book right now that I have both in paperback and on Kindle, and just two nights ago I spotted, in BOTH versions, an occurance of the word “Yhey” when they clearly meant “They.” It’s just a typo, for godsake! It has nothing to do with the overarching point, which is not diminished by the typo. Additionally, if you had any editing experience at all, you’d recognize whether any writer actually can’t spell (by the pattern) or merely makes a few typos. In addition to the typo you spotted, this keyboard on my wife’s notebook is becomng so worn that it occasionally “bounces” some keystrokes, and causes duplicate letters; that’s especially happening with the spacebar. I also type pushing 90 words per minute, and often think ahead of where I’m typing so that I will, for example, knowing that the phrase will be “word that” accidentially type “worth that,” by letting the “th” go from my brain to my fingers a bit too early. All of those are just typos, as was what you anally-retentively cited. I am a SERIOUSLY good speller; and your citation was offensive. Some people — and you appear to be one of them — just can’t tolerate anyone telling anyone else that they’re wrong, or that there’s a better way to do things. Some people just can’t sit and watch it and allow the person being advised to learn and become better. Instead, probably because they’ve had someone — probably a parent — in their lives correct them to the point of pathology, they come into places like this and challenge people like me who are unassailably correct, just because they can. Shame on them, an you, for it. Is anyone aware of Sprint Reader? It seems to be more flexible than Spreed and provides the ability to set delays for the end of sentences. It didn’t appear in a Google Store search but was recommended to me by a friend. This Grumpy old Grandpa (Gregg) has ruined all my mood to continue reading for now. Martin, please introduce some filters and I advise the Grumpy Gregg to start his own blog since he has enough spare time and “bauds” available at his disposal to write all the dictionary in one comment.